American political correctness has actually gotten a television ad airing on the other side of the planet pulled for perceived racism. Yum Brands Inc, the owner of fastfood chain Kentucky Fried Chicken, recently launched a commercial series in Australia called "KFC's Cricket Survival Guide." In it, spokesman "Mick" gives Aussies "tips on how to get through this summer of cricket." After being posted online, the advertisement attracted the attention of U.S. media, with the New York Daily News and Baltimore Sun running online polls of readers on whether it relied on stereotypes. We have been made aware that a KFC commercial being shown on Australian television has apparently caused offence, particularly in the United States, after a copy of the commercial was reproduced online without KFC's permission. The ad features supporters of the touring West Indian cricket team and was intended for Australian audiences only. It is part of a broader series - The Cricket Survival Guide - which provides tongue-in-cheek advice to Australian cricket fans during the 2009/2010 cricket season. While we believe this light-hearted commercial has been well understood by Australian cricket fans, to avoid the possibility of any further offence being caused by the advertisement either here or online overseas, KFC will cease running the commercial immediately. KFC Australia apologises unreservedly for any offence caused which of course was wholly unintended. It's entirely possible that this video was created by a 'guerrilla' ad outlet looking to gain some attention. We've seen that tactic used in the past and it could be the force behind this video as well. Still, if it is a genuine KFC advertisement, it could be seen as racially insensitive. 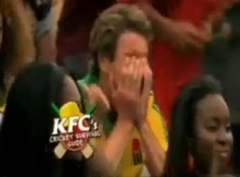 In should also be noted that KFC's motive may have been to portray a fan stuck in the opposing team's section. The racial makeup may make perfect sense for that team. You decide. The colonel may have a secret recipe, but all KFC has cooked up with a new ad is a racism controversy. U.S. critics are assailing the fast food chicken joint's latest ad in Australia as supporting racist stereotypes. In the Australian media, the reaction has been mixed, with some commentators accusing Americans of "insularity". Brendon O'Connor, an associate professor at the University of Sydney, told 9 Network News that the association between fried chicken and ethnic minorities was a distinctly US issue: "They have a tendency to think that their history is more important than that of other countries." Americans might think this is racist because black people﻿ eating fried chicken is a stereotype that exists in their country. This ad was shown during cricket matches between Australia and the West Indies. If England had been playing at the time, the ad would have shown the bloke feeding chicken to the Barmy Army to make them sit down and shut up. There's no racism intended or perceived in Australia. The complaints I've seen have come from Americans guilty about [sic] they treat people in their country. That Americans would misunderstand another country's culture is one thing. But for our PC Police to now be enforcing its ignorant standards from thousands of miles away should scare the heck out of folks on both sides of the aisle. For the record, here's Mick explaining what this ad campaign was all about. Seems pretty racist, doesn't he?